The fifth queen of Henry VIII, a daughter of Lord Edmund Howard and a granddaughter of Thomas Howard, 2nd duke of Norfolk (d. 1524). Her father was very poor, and Catherine lived mainly with Agnes, widow of the 2nd duke of Norfolk, meeting the king at the house of Stephen Gardiner, bishop of Winchester. 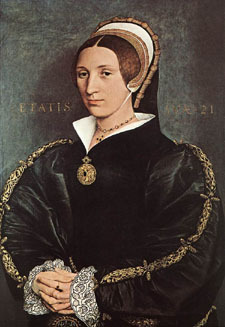 Henry was evidently charmed by her; the Roman Catholic party who disliked the marriage with Anne of Cleves, encouraged his attentions; and after Anne's divorce he was privately married to Catherine at Oatlands in July 1540. Soon afterwards she was publicly acknowledged as queen. Before her marriage Catherine had had several lovers, among them being a musician Henry Mannock, or Manox; her cousin, Thomas Culpepper; and Francis Dereham, to whom she had certainly been betrothed. After becoming queen she occasionally met Dereham and Culpepper, and in November 1541 Archbishop Thomas Cranmer informed Henry that his queen's past life had not been stainless. Cranmer had obtained his knowledge indirectly from an old servant of the duchess of Norfolk. Dereham confessed to his relations with Catherine, and after some denials the queen herself admitted that this was true; but denied that she had ever been betrothed to Dereham, or that she had misconducted herself since her marriage. Dereham and Culpepper were executed in December 1541 and their accomplices were punished, but Catherine was released from prison. Some fresh information, however, very soon came to light showing that she had been unchaste since her marriage; a bill of attainder was passed through parliament, and on the 13th of February 1542 the queen was beheaded.